Subperiosteal rhytidectomy can be used to reverse facial aging of the midfacial and lower facial region. The evolution of the facelift began with simple cutaneous remodeling and expanded to address subcutaneous layers. As techniques advanced, desire to improve the appearance of the nasolabial fold resulted in deep-plane rhytidectomy. Subperiosteal facelifting is a point along the facial rejuvenation continuum. In 1969, Skoog reported techniques for treating deeper facial structures; in 1974, he put forth the sub-SMAS technique that altered the soft tissues of the face in a conjoined fashion. 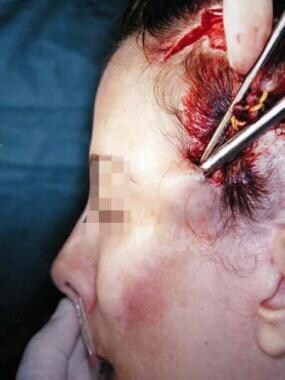 Prior to this time, facelifting involved predominantly subcutaneous dissections (see the image below). A cheek flap is developed in preparation for a deep plane dissection. Tessier described the subperiosteal approach for the superior and lateral periocular area in brow rejuvenation and facelifting. He termed the procedure "orthomorphic subperiosteal face lift." Psillakis,  Vasconez in 1986, Ramirez, [3, 4] and others have expanded and modified the subperiosteal approach. The superficial muscular and aponeurotic system (SMAS) is incised to facilitate a deep plane dissection. The superficial muscular and aponeurotic system (SMAS) is imbricated and secured in a more superior posterior position with sutures. The subperiosteal facelift repositions the deep facial tissues overlying the bone, re-establishing the facial skeletal and facial soft tissue relationship (see the image below). When an endoscopic forehead lift is done in conjunction with a facelift, the lateral port can be used as an access site for a midface lift as shown here. Weakening of the retaining ligaments of the face are related to facial changes. Furnas provided a description of these ligaments that suspend the more superficial and mobile anatomical structures from the deeper and akinetic facial constituents. Fasciocutaneous and osseocutaneous ligaments have been described, with the former extending from the dermis to the facial fascia and the latter from dermis to periosteum. Loss of bone and atrophy of facial fat are also believed to result in the skin sagging and drooping over the facial skeleton (see the image below). Creation of partial thickness Endotine hole for placement of device. Subperiosteal facelifting is indicated for the elimination of rhytides and improvement of the nasolabial folds' appearance. 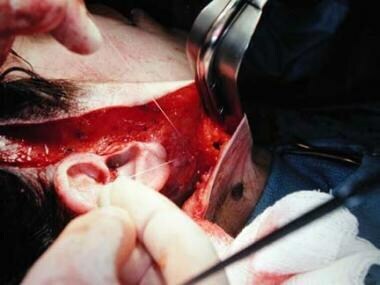 Superior to the zygoma, the skin has a robust blood supply from the superficial temporal artery. 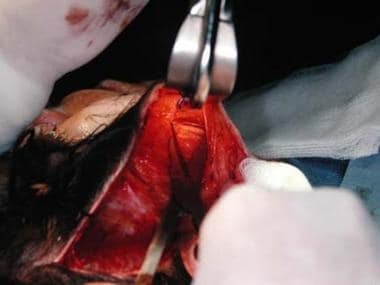 Below the zygoma, the facial and the transverse facial arteries provide blood flow to the skin before anatomization with the superficial temporal artery in the subdermal region. These 3 vessels emerge from the external carotid artery, while other tributaries arise from the internal carotid artery, including the supraorbital and supratrochlear branches. The facial musculature and the superficial fascia of the parotid and cheek area are referred to as the superficial muscular and aponeurotic system (SMAS; see the image below). Most authors acknowledge the galea as the SMAS superior boundary and intermingling with the platysma as the lowest SMAS extension. Where the SMAS courses over the deep temporal fascia, it is commonly labeled the temporoparietal (superficial) fascia and contains the superficial temporal artery and frontal branch of the seventh cranial nerve. The temporal branch of the facial nerve traverses the zygomatic arch in an anterior and unprotected fashion. Although often referred to as singular, the temporal branch of the facial nerve has a variable number of nerve rami and patterns. During dissection of the periosteum overlying the zygoma, be aware that the SMAS is completely intertwined within the periosteum. As the SMAS passes over the parotid gland, it attaches to the deep fascia and skin via parotid-cutaneous ligamentlike tissue projections. The SMAS courses anterior to the masseter muscle, then dives to enshroud the muscles of facial expression. The buccal branches of the facial nerve are in a sub-SMAS distribution in this area. A subperiosteal route of dissection is best used to avoid neural structures of the midface and allow for improved appearance of the nasolabial fold. This procedure is contraindicated in patients who are not medically stable or cannot tolerate anesthetic agents and in patients who do not have realistic expectations of the surgical outcome. Tessier P. [Subperiosteal face-lift]. Ann Chir Plast Esthet. 1989. 34(3):193-7. [Medline]. Psillakis JM, Rumley TO, Camargos A. Subperiosteal approach as an improved concept for correction of the aging face. Plast Reconstr Surg. 1988 Sep. 82(3):383-94. [Medline]. Ramirez OM, Pozner JN. 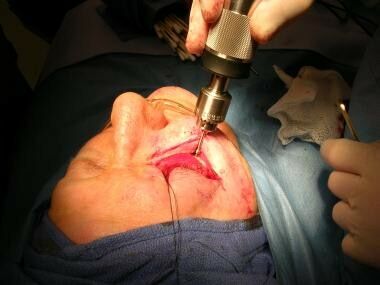 Subperiosteal minimally invasive laser endoscopic rhytidectomy: the SMILE facelift. Aesthetic Plast Surg. 1996 Nov-Dec. 20(6):463-70. [Medline]. Ramirez OM. High-tech facelift. Aesthetic Plast Surg. 1998 Sep-Oct. 22(5):318-28. [Medline]. American Society for Aesthetic Plastic Surgery. Despite Recession, Overall Plastic Surgery Demand Drops Only 2 Percent From Last Year. American Society for Aesthetic Plastic Surgery. Available at http://www.surgery.org/media/news-releases/despite-recession-overall-plastic-surgery-demand-drops-only-2-percent-from-last-year. Accessed: 3/18/2010. Quatela VC, Sabini-P. Techniques in deep plane facelifting. Facial Plast Surg Clin North Am. May 2000. 8(2):193-209. Stuzin JM, Baker TJ, Gordon HL, et al. Extended SMAS dissection as an approach to midface rejuvenation. Clin Plast Surg. 1995 Apr. 22(2):295-311. [Medline]. Toth BA, Daane SP. Subperiosteal midface lifting: a simplified approach. Ann Plast Surg. 2004 Mar. 52(3):293-6. [Medline]. Patrocinio LG, Patrocinio JA, Couto HG, et al. Subperiosteal facelift: a 5-year experience. Braz J Otorhinolaryngol. 2006 Sep-Oct. 72(5):592-7. [Medline]. Hönig JF, Knutti D, Hasse FM. Centro-lateral subperiosteal vertical midface lift. GMS Interdiscip Plast Reconstr Surg DGPW. 2014. 3:Doc04. [Medline]. [Full Text]. Sclafani AP. Comprehensive periorbital rejuvenation with resorbable endotine implants for trans-lid brow and midface elevation. Facial Plast Surg Clin North Am. 2007 May. 15(2):255-64, viii. [Medline]. Newman J. Safety and efficacy of midface-lifts with an absorbable soft tissue suspension device. Arch Facial Plast Surg. 2006 Jul-Aug. 8(4):245-51. [Medline]. Jones BM, Lo SJ. The impact of endoscopic brow lift on eyebrow morphology, aesthetics, and longevity: objective and subjective measurements over a 5-year period. Plast Reconstr Surg. 2013 Aug. 132 (2):226e-238e. [Medline]. Cheng ET, Perkins SW. Rhytidectomy analysis: twenty years of experience. Facial Plast Surg Clin North Am. 2005 Feb. 13(1):15-31. [Medline]. Guyuron B, Watkins F, Totonchi A. 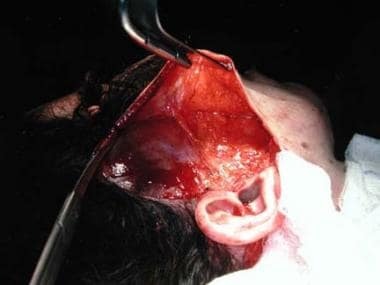 Modified temporal incision for facial rhytidectomy: an 18-year experience. Plast Reconstr Surg. 2005 Feb. 115(2):609-16; discussion 617-9. [Medline]. Mercandetti M, Cohen AJ. Anesthesia, Local With Sedation. Medscape Reference Journal. [Full Text]. Subperiosteal midface dissection via a transconjunctival approach.